Yes me too. It would be grate to make Alphacool work again. That was its crucial functionality for me and many others. Now the plugin doesn't support last edition of Everest neither Aida64. I'm really looking forward to see this plugin. Any news/progress on this one? Because without aida64/everest my LCD panel is just something that unnecessarily consumes energy without a purpose. I joined this forum just for this. I use Aida64 and i m really happy with it. But i used to use my Alphacool lcd and evererst while gaming and while folding with my screen off. Now my alphacool lcd is useless. Do you have any updates on this matter plz? I have absolutely no idea on both of these. Why dont you try to contact with alphacool? They should be able to guide you on whatever you need! Please see post#3 above by Namuk. I did email Alphacool but i heard nothing on the SDK ect bit of a joke really, the thing is Alpha still sell the Alpha Lcd:rolleyes: Gutted as i doubt i could do without now. Namuk have you tried to contact with Sonic again? the forum went down a while ago and that was the only place i new to get hold of him as Sonic was the Developer of the Alpha software on there , i even search the name thinking Sonic would be on another forum or own site and i got no were there as well. Also, I was wondering if there were or could be any plans to introduce support for the all-in-one water cooling solutions on the market. 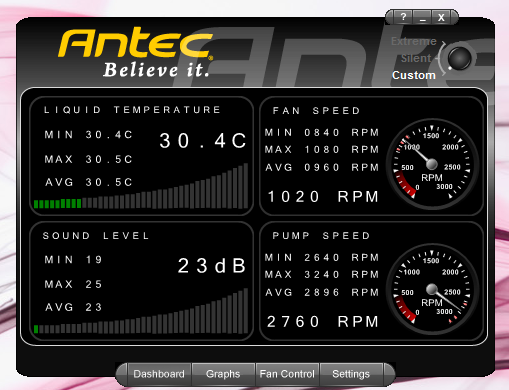 Antec and Corsair have similar systems made by Asetek. They seem to work with people really well so maybe they would even provide a plugin or something. Just a though. I attached a pic of the software that comes with the antec 920 that I own. But Corsair also has their own systems with the Corsair Link software that maybe could be integrated. It would be nice to just use the Aida interface instead of all the ones I have to use. Thanks Much! Good idea, although please note that Corsair Link is not officially released yet. We're working with Corsair on implementing Corsair Link support in AIDA64. We'll contact Antec to find out if we can do the same with their products as well. here are the sample code to get the values stored from Everest in the shared memory (file/options/ext. Apps/activate shared memory). Since Aida64 is essentially the same application as Everest and since there is no way to obtain the source files for the alphacool applications/plugins etc. why not add an option in "AIDA64 / Preferences / External applications" saying "Report as Everest_SensorValues to shared memory" or "Make values AlphaLCD Compatible" or something similar. AlphaLCD is getting data from everest up to version 5.50. so my guess is that would do the trick. So until now, noone has found a solution? I found a link for lcdhype to work with aida64 with a plugin, but i have no idea how to work with lcd hype! No new for a aida64 plugin for alphalcd ?? I guess noone interrested in making this work and the solution i gave is fairly simple. The description is not clear to me. Please carefully. I have a beta version given in the link and I can not get the cooperation of the Alphacool LCD. I'm sorry, but I cannot phrase that more clearly in English, I really did my best to make it clear. Please use Google Translate to translate it to your native language. Totally do not know what to do. Please explain exactly how to run the show on the Alphacool readings from Aida. None of this I do not understand. Do I need to have installed Everest and aida 64 and where the swap file? Sorry for the inconvenience and thank you for your help. Fiery big thank you for your patience and detailed instructions. have you a tips for my probleme ? Try to rename AIDA64. * files to Everest. * Maybe AlphaLCD is looking for a process called Everest.exe?